*Oprah Winfrey had to take to her YouTube page yesterday to tell folks she cannot be Captain Save-a-Soap. Once ABC announced that its long-running soap operas “All My Children” and “One Life to Live” would be cancelled, fans of the shows began bombarding the talk show queen with requests for her to air them on OWN. 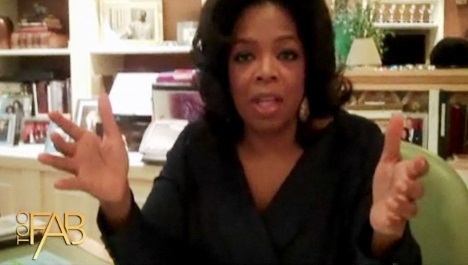 Winfrey made a video explaining why she just can’t. Winfrey then lays out the unfortunate ratings statistics. Click here to watch Oprah’s video. “All My Children” has been on the air since 1970, and “One Life to Live” debuted in 1968. Both were given the ax last week. she’ll do it, her ratings are sinking like the titanic. And how would you know unless you try? Not to mention that this could be the source of am entirely new audience for the network. Some of these people probably would have never watched OWN if not for their favorite soap moving there. I don’t watch these soaps, but I wish cable would step up and save more of these shows that are constantly given the ax by broadcast tv, most times for no good reason. It’s an issue of budget. The major networks still average many more fewers than most cable networks which means they, the major networks, charge much more for ad space. Three or 4 million viewers is considered a hugh hit on cable, but will get you cancelled on the big networks. So even if a cable channel was to pickup a show with that many viewers from one of the networks, while it would definitely boost their overall viewership, they would have drastically cut the production costs of the show to make it profitable. What is sad in the lost of these soaps are more job opportunities for actors/actresses. So many actors/actresses got their start in soaps. I haven’t watched since college. But it possibly has run its course. As much as I resist them, it seems to be the age of so-called reality television…..effectively putting an entire class of actors/actresses/directors/writers out of work. I think that someone should try, but not a daily soap make it a weekly soap, less money to produce. DO on a trial basis to see if it gets a return on investment. There may not be an audience at home watching it, but we’re taping it, Oprah!